What they do: Automate Ads (formerly Kuhcoon) is the first fully automated, data-driven ad campaign manager. It eliminates the need for human management of ad campaigns using technology and data science that automatically places the best ads on the right device, in front of the right audience, at the right time.Why it's a big deal: The advertising industry manages $71 Billion of Facebook and Google ads every year that computers can deliver more efficiently. Automate Ad’s campaign management algorithms process millions of data points in real time to optimize for bid price, placement timing, demographic targets, creative performance, generating conversions that are 31% cheaper than human managed campaigns on average. They originally developed the technology to predict seizures in epileptic patients, and started Automate Ads when they realized how well it could be applied to advertising. It’s so automatic, that companies no longer need humans or agencies to manage their campaigns.They only launched three months ago and already have 1,800 clients with 15 more signing up every single day. Their next goal: automate every single ad campaign on the internet. 1 46% week over week customer growth since January launch. 2 1,800 customers since launch. 3 Campaigns average 145% ROI vs a manually managed campaigns. 4 Customers manage $50,000 in ads per week and rising. 5 Launched in for both Facebook and Google. 6 Built proprietary neural network data science technology. Andrew is a published writer, has been a paid media consultant since age 19, and was named to Pennsylvania's Top 20 Under 40. An alum of Y-Combinator. Because they’ve solved the last piece of the ad business that software can possible solve. Humans will always be necessary to create the ads, but Automate Ads has managed to eliminate people from the rest of the process completely. Companies no longer need a full-time in-house manager nor do they need to waste 15% of their budgets on an agency. With Automate Ad's automated system companies have more money to advertise with, and a process that is nearly 1.5 times as effective. Not only that, but the technology Charles and Andrew have built over the last three years is so complicated that it will be very difficult for anyone to catch up. It's a neural network - a form of machine learning – that uses data from $300 Million in advertisements to automatically serve ads in the most cost effective markets instantaneously. They’ve finished the software for Facebook ads and are about to finalize Automate Ads for Google; we’d be surprised if anyone can stop these guys. Founder of Parse and Scribd. Investor in Reddit, LendUp, and Optimizely. Founder of Equidate. YC alum. Formerly Zynga, Google, Carnegie Melon. Investor in Coin and Zenefits. Y-Combinator Alumni. Investors in Zenefits, Coin, Beep, and more. Grivner Capital Group invests in seed and early stage companies. Serial Entrepreneur, CEO of SingleHop. Interested in investing in passionate entrepreneurs. Entrepreneur. Digital Marketer. Investor. Co-founder of AllAboutDance.com. Investor in Kuhcoon. Passionate about tech. Pursue your dreams. 17 years IT experience. Eventually moved to Silicon Valley and joined Parse, then Facebook. How does Automate Ads compare to having an in-house manager or hiring an agency? Managing ads is a full-time job, it requires constant monitoring because money is being spent 24/7 when ads are live. Because of this companies either hire a full-time in-house manager or spend 10-15% of their budgets on an agency. These ad managers spend their entire day creating campaigns, A/B testing different creative variants, pausing and starting ads based on performance, and selectively targeting segments like gender, age, and interests. Automate Ads handles every aspect of this day-to-day management outside of providing creatives. With some high level data, a few images and a couple copy variants we'll automatically do the testing to figure out what works best and drive the budget into the top single performing ad at all times. Our system also monitors performance 24/7 so when there is a drop in conversion volume or a price increase we'll stop that ad automatically and create a new one in a different segment that will perform better for the price. Why won’t Facebook build this themselves? First of all, we're not singularly tied to Facebook. We're actually going to be launching Google Adwords integration in early May, and then plan to expand to mobile ad networks and other paid channels like Yahoo! Search, Bing Search, Pinterest, Twitter, etc. Automate Ads will eventually span all paid media advertising both on mobile and the web. But there are a number of reasons why Facebook won’t compete with us: 1/ they make more money when advertisers are manually managing their campaigns and 2/ Facebook needs to provide an advertising platform that works for advertisers of all sizes. This type of optimization doesn't necessarily work for every type of advertiser, specifically very large advertisers spending tens of millions of dollars a month. Why do they make more money when advertisers manage their own campaigns? Every ad network makes more money when advertisers manually manage their ads as a whole because there is so much testing involved and campaigns aren’t perfectly optimized by individual paid media managers. Ad managers put up and pay for multiple ads at once to see which performs best. Many times what works best ends up surprising them and ends up taking a lot of time and money to discover. Also humans can’t effectively optimize their campaigns 24 hours a day. Even with the help of current paid media management software, there still remains a heavy manual workload from people. That being said, a great majority of Facebook’s revenue comes from third-party marketing developers like us who support and provide custom solutions to advertisers. The only problem right now is none of these third-parties are fully automating the management of campaigns. How well does Automate Ads optimize? By using technology and data science our campaigns perform 145% better than a manually managed campaign. A lot of that has to do with the fact that we can monitor and make changes to campaigns 24/7 whereas a human only has 8-10 hours of a day that they're actually manually managing this campaign. What we've built is a neural network - a form of machine learning – that automatically reads current ad prices, analyzes trends from past performance, and serves ads in the most cost effective markets instantaneously. Our data-driven Intelligence System is backed by over three years of data-science engineering across 300 million dollars in ad spend data. The Intelligence System automatically discovers the perfect combination of creative, target market, and bid to help advertisers maximize conversion volume and minimize conversion cost. When a major competitor is entering a target market, and before they actually start spending we'll pause our ads before the price jumps. When a competitor is pulling out of a target market Kuhcoon will trigger ads to start spending again as the price drops. We’ve also built automation technology to segment every target market into several different ad sets. For the first 24-36 hours, Kuhcoon collects baseline data by running one ad in each target demographic. Once we have that data, we optimize by constantly driving the budget into a single top-performing ad. We base performance on two key metrics: cost and volume of conversions. So if an ad is performing really well and all of a sudden we detect falling performance, we'll pause that ad immediately and create a new ad in a different segment that we predict is going to perform better based our baseline data, our in-house dataset, and real-time prices from Facebook’s API. How do you compare to other products in the market? The majority of products in the market are managed services companies that make it easier for people to manage ad campaigns – like the basic Facebook ad manager with a few more bells and whistles. They all claim to optimize your ads with “rule-based optimization.” Which allows the ad manager to set rules like price ceilings on specific ads. The problem with that is that most ads never get a chance to actually perform when you're using rule-based optimization because the rules are too strict and aren’t based in real-time data. If an ad is really effective at a slightly higher bid price, and the cost per conversion is actually lower Automate ads will serve that ad again and again. The other big problem with rule-based optimization is 95% of advertisers are confused by it and are unsure of what to bid. Additionally, most software (including Facebook’s and Google’s own ad managers) randomly selects which creatives to serve and never tests the effectiveness of each individual ad. We’re combatting the random selection process by giving every creative, every message, and every target market a chance to actually perform and then optimize for the best ads. Automate Ads makes optimization decisions based on data and not just random tests coupled with arbitrary rules. Automate Ads is free to sign up right? Are you the only ones doing that? Yes, anyone can sign up, connect an ad account, and create their first campaign all within 5 minutes. Most ad tech companies and agencies require some form of paid demo and long form sales process. We offer an open solution that makes it easy to capture the tail end of the market with very minimal effort. We also have an industry agnostic product that really can suit almost every advertiser. We’re going after what we call the "mid-market,” companies spending anywhere from $20,000-$500,000 a month in specific verticals like technology, e-commerce, and early stage startups. Most of these companies have 1-4 marketing managers who all wear multiple hats, they don't have the time to sit here all day and manage campaigns. 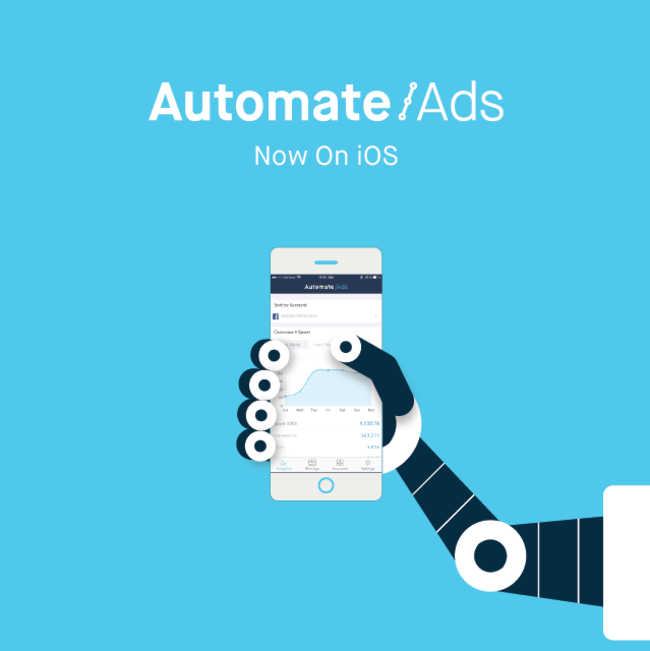 With Automate Ads, they can automate much of their advertising work and focus on the creative or other parts of the business. They also don’t have to hire another person or allocate one of their marketers full-time to this task. And we’re robust enough that we can grow with any company as they scale. We’ve been talking to many mid-market e-commerce and mobile app companies that have a hard time scaling their paid acquisition strategy. They all want a plug-and-play solution so they can finally bring their entire marketing process in-house. Automate Ads allows them complete freedom to create the ads, but then takes over the entire management burden so they no longer have to give away 10-15% of their budget to an agency. How much better is Automate Ads than self-managed ads? Our campaigns average 145% ROI vs a manually managed campaign of the same budget. We know this to be true because we have all the data from advertiser’s past campaign performance. We can see their past campaigns and compare that performance to the campaigns after Automate Ads takes over. Again, the reason that we're performing better is because our system is monitoring their campaigns 24/7 as opposed to 8-10 hours a day. The other thing is humans are fallible. Humans make mistakes, and technology and data science are less prone to mistakes. Right now our Intelligence System can predict market shifts with 81% accuracy and as we collect more and more data that gets stronger and stronger over time. Can Automate Ads replace an entire ad team? No, the creative component of making ads will always be critical. We’re going to replace the industry of people that are actively managing campaigns.I always say that optimization of paid media campaigns is 50% human and 50% technology. No software can replace the creative mind of a human, but a computer can optimize ad placement and timing much better than people can. So, we're not necessarily trying to kill the agency, we're trying to work with creative agencies while eliminating the need for a paid media manager. Why not work directly with agencies as an acquisition channel? We are. We’ve already signed on agencies that use us to manage their clients' accounts. They'll charge their client 10-15%, give us the 5% for actually doing all of the heavy lifting, and then not tell their clients that they're using us. We are ok with any advertiser using our product, but most paid media agencies still see us as a threat, which makes this strategy difficult. Hopefully we can prove that this technology is the future and they can either adopt us now or inevitably sometime down the line. How fast are you growing? How do you measure that? We launched a soft launch in mid-January and then we went public in mid-February on TechCrunch and since then, we've on-boarded over 1,800 advertisers. Those advertisers are managing $50,000 a week through our system, and we take 5% of everything they spend. We eat our own dog food, and acquire many of our advertisers by using our own product to do so for approximately $25 per client. We’re also adding 10-15 new clients a day via word of mouth. But we're in the process of finishing up our AdWords integration, and want to wait to ramp up acquisition until we can offer both Facebook and Google ad management. Have your new clients transitioned all their campaigns over to Automate Ads? They’re all transitioning slowly; it takes a while because many of our customers have hundreds or even thousands of campaigns. We’re trying to make it a lot easier for them to transition those campaigns so they don't have to recreate every single campaign one-by-one in Kuhcoon. So we’re building technology to automatically pull all active campaigns onto the Kuhcoon platform. Our first customers, the ones that signed on in January and February have transitioned all of their ads to Automate Ads. Most customers seem to test the system for 30-60 days before fully transitioning their ad management system. Our new tech will speed this up by allowing customers to push one button and transition all of their active campaigns into Automate Ads automated campaigns. How did you come up with Automate Ads? Before this we were a paid media agency for about 2 years manually managing campaigns for clients. We saw how inefficient the process was, and built an in-house system to automate it all. First we built the Neural Network, the optimization technology behind the system over the last 2-3 years. We used this optimization system in-house to optimize our client’s campaigns. We realized how well the technology would apply to ad tech as a whole and started building a neural network to optimize our client's paid media campaigns. Then we expanded the functionality to allow us to manage ads from our phones using an app. This was our first product that launched in January of 2014. We never advertised it, but several hundred customers found us and became our beta users. We started learning that they had a lot of familiar pain points with the day-to-day task of managing campaigns. We then focused on ad automation and launched the full version three months ago. Tell us about the team. How will you spend the money from this round? The purpose of this round is to expand our team over the next 6-9 months and have a budget for paid acquisition. We plan to get to $250,000 monthly recurring revenue by the end of 2015, early 2016. How involved is your onboarding process? We’ve spent a lot of time perfecting our onboarding process to make it as easy as possible. Potential customers can sign up directly on our website in about 5 minutes. Users sign up with an email, password, and Facebook/Google ad account. They then add a credit card and create their first campaign. The first campaign only requires 3 data points: how much they want to spend, the target customer, and the campaign goal. They upload 4 images and 4 different messages for the A / B test. Once they hit create, it’s all set and they can forget about it. We'll completely manage it. We'll optimize it, and it requires very minimal effort from the advertiser. Our competitors have long arduous sales processes with sales reps, tedious onboarding training, etc. We can get a new customer going in just five minutes. Why aren’t your growing faster, and how will you? First, we’re in the process of rebranding to "AutomateAds.com" because it makes a lot more sense and is exactly what we do. The URL will be great for search and 'Automate Ads' will legitimize the product a lot more in the marketplace. The second step for growth is perfecting our paid acquisition strategy. Right now we pay $25 per customer but we’ve done very minimal testing of our own ads, and are certain we can do better than this. Once we perfect that, it's all a matter of scaling and then developing our own direct sales process focused on new verticals we want to tackle, specifically, mobile gaming, e-commerce, and recently funded fast growing startups. Our bread and butter customer will be those advertisers that spend $20K-$500K per month. We’ll be building out our sales team over the next few months to handle this target market. Our site makes it super easy to generate leads, the second someone connects their ad account to our system, we can see what brands they are working with, we have all of their contact information, and see how much money they're actually spending or how much money they've spent in the past. Everyone who signs up will be a super warm lead, and all this information will allow us to target advertisers that are actually worth our time. We’ll also have a higher touch sales process for really big potential customers. Bigger advertisers with huge budgets aren’t necessarily going to on-board themselves and just give Automate Ads a try. But these guys will be a huge revenue stream for us, and our sales team will give them the soft touch necessary to signing big clients. That being said, the platform is 100% self-serve. It doesn’t matter whether a customer is spending $1,000 a month or $500,000, they can still sign up in five minutes and start automating their ads right away. Finally, we’re expanding the automation platform to handle mobile ad networks like: Google, Yahoo! Search, Bing Search, Pinterest, Twitter, etc; which will really expand our potential client base. As the product continues to progress, and we integrate these new paid media channels, our advertisers will have new opportunities to spend money across other channels as they transition those ads to be managed by Automate Ads. There is a huge upsell opportunity for every ad network we ad to the platform. Integrating mobile ad networks and Google Adwords in early May will be especially huge for us. What’s the biggest problem you have to solve? Really, it's about getting to market. That's probably the biggest fear right now. We’re a small team so competitors underestimate our product and think it’s just another re-skinned ad manager. But all of the magic is happening on the backend, all the optimization and automation is something most potential clients don’t see at first until they actually run a campaign. Our data science technology is really unique and definitely our strongest asset, but we still have to get this product out there, tell everyone, and get people using it before another automation platform pops up. What is so special about that data science? This neural network is what we’ve been building over three years. My co-founder specializes in big data and data science engineering and it's not something that a large technology company can just throw a couple of engineers at and build. It would take a really good team 6-12 months just to get something up and running. By the time that happens, we'll be a dominant player in the space. There is nobody competing directly with us right now because what we’ve built is so new. Last year, Facebook advertisers and Google Advertisers spent $71 Billion. What's happening right now is a multi-billion-paradigm shift in paid advertising where budgets are shifting from newspapers, magazines, radio, and TV into digital ads, specifically into social and mobile ads. Just to give you a more general idea, Facebook has 2,000,000 total advertisers. But there are 25,000,000 brands that exist on Facebook and only 2,000,000 have ever created a single ad - 500,000 of those 2,000,000 created their first ad in the past 9 months. Of those 500,000, probably 495,000 of them are small and medium businesses and our exact target market. And that’s just Facebook. Over the next 2-5 years, we're going to see this market increase by billions of dollars. Online advertising is still in its infancy. We’re getting in this market early with an all-in-one solution that only takes a few minutes to set up. We’ll be able to test every ad across every paid media channel, figure out which media channel works best for that specific campaign, and drive their budget into the channels that work the best. Right now, nobody is doing that. Automate Ads is conducting a Regulation D offering via Wefunder Advisors LLC. CRD Number: #167803. Meet the team, check out the office, and learn more about the Automate Ads mission in this video feature. Chief Storyteller at Wefunder. Mother of three beautiful guinea pigs. No one is talking about Automate Ads yet! Thanks for vouching for Andrew! If you'd like to invest in Andrew, please open an account. We'll waive your fees if you do it now. We asked Andrew for 10 personal references. Can you vouch for Andrew?